Hidden away, almost invisible, this Thai culinary treasure trove with lots of parking and easy access might easily be missed when driving down Sheikh Isa Avenue. An authentic Thai chef guarantees a treat of hand-made, fresh and spicy gastronomic delights from real Thai recipes and ingredients that will lure you back regularly. The small, well-decorated and lit entrance displays traditional Thai artwork and a running water feature with beautiful koi carp. Walking up the wooden steps, a strong odour of Thai hardwood and furniture oil brings back memories of old buildings and hotels in days gone by. The interior will stun you with its enormity and seating arrangements. The staff are traditionally dressed with “Sawadika” welcome patrons on arrival. The expansive dining hall and traditional seating offers almost all configurations in what can only be described as a true Thai environment. The food is outstanding and good value for money but remember “spicy” means “spicy” and the Thai words “pèt mâak mâak” (very spicy) should be used with caution! It would be an error not to try the Tom Yam traditional Thai seafood soup, which is out of this world and almost addictive. 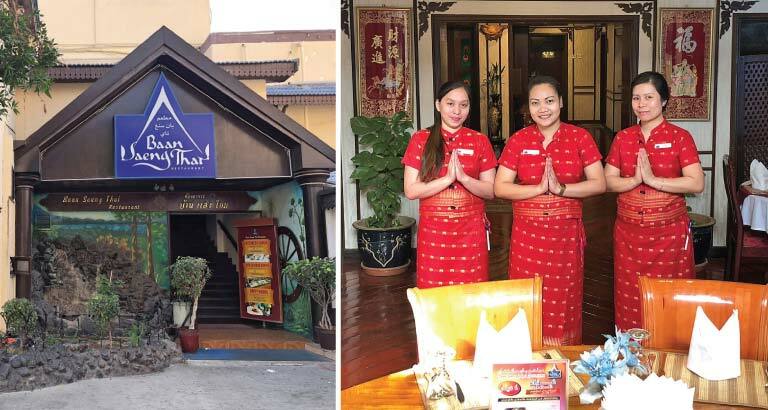 One thing is for sure – if you haven’t tried the Baan Saeng Thai restaurant in Adliya, you have missed out on one of the real hidden treasures of Bahrain.